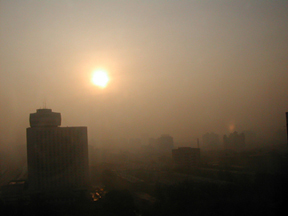 Morning sun tried to pierce the thick smog hanging over Beijing in the summer of 2003. As the world settles in to watch the opening ceremonies for the Summer Games of the XXIX Olympiad in Beijing, China, tonight, atmospheric scientists are also gearing up to keep watch — on the skies. With the blessing of Olympic organizers, researchers at the Scripps Institution of Oceanography in La Jolla, Calif., and Seoul National University in South Korea will send a fleet of autonomous unmanned aircraft flying above the polluted city to measure its smog and weather conditions during the games. The Chinese government has spent billions of dollars on measures to clean up Beijing before the games, including such improvements as reducing industrial activity by 30 percent and limiting the numbers of cars on the road by instituting alternate-day traffic bans on drivers. Last week, Chinese officials also attempted cloud-seeding to help rain out aerosol particles (and promote sunny skies). 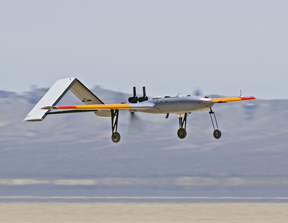 An automated unmanned aircraft measures air pollution in Southern California in April. Scripps scientists will send a fleet of similar aircraft to assess air pollution over Beijing beginning Aug. 9, coinciding with the 2008 Olympic games. But yesterday, Beijing was still shrouded in its usual blanket of thick smog, with visibility down to about 500 meters. Thus, how much the government’s varied efforts have improved the region’s ongoing climate woes isn’t clear. China’s actions do offer an unprecedented opportunity, however: to observe how the atmosphere responds to such large-scale changes in emissions in a highly populated region, the researchers say. The team, led by Scripps climate scientist V. Ramanathan, will begin monitoring the concentration and movements of dust, soot and other pollution particles across Beijing and other parts of China on Aug. 9, and will continue their measurements through Sept. 30.